Soccer history began in the mid-nineteenth century, when the game of soccer was developed in England. However, the origin of soccer goes as far back as 2500 B.C. It is believed soccer derived from a combination of ancient games. 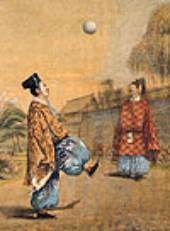 The Chinese are credited with the earliest form of soccer, commonly recognized as approximately 2500 B.C. They played a game called "Tsu Chu", which may be translated to "kicking the leather and stuffed ball with feet". The game was part of the physical education program used to train soldiers. The goal was a net with a hole strung between two bamboo poles that were 30 feet high. To "score", the ball had to go through the hole in the net and players were not allowed to use their hands. In approximately 50 BC, the Japanese played a game in which players kicked a ball made of deerskin on a small field. They called it "Kemari". The game was not competitive and was played by different classes of people to exercise and relax. The ball was simply passed from player to player in the air and was only touched with the feet. A game called "Episkyros", between two teams of 12 players with one ball, was played in Ancient Greece. However, the rules of the game allowed using hands. The Romans adopted the game of "Episkyros" from the Greeks and by allowing kicking during the games; they created a rugby-style game, which they called "Harpastum". The ball was made from a stitched leather skin and stuffed animal fur. "Harpastum" was a very fast, physical and violent game. The number of players varied from game to game, some reports suggest games with hundreds of players on each side. If you are interested in more detailed information about soccer history, especially the origin of soccer, click here. 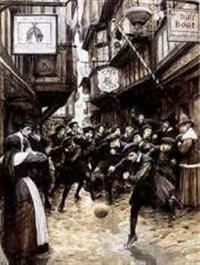 The English had been playing games similar to soccer (football) from around the 8th century. Many early games were disorganized and violent affairs with any number of players. In the early 14th century the Royal Family banned soccer because, according to King of England Henry V, people were spending too much time playing soccer instead of practicing archery for military purposes. The threat of imprisonment for playing soccer didn't make any difference whatsoever, the game still stayed very popular among the working class. In the early 1800s, a number of versions of soccer were being played in private schools throughout England. But it was nearly impossible for different schools to play each other because teams couldn't agree on the rules. Some allowed players use their hands; others did not. In 1848, students from Cambridge University tried to create the first rules that everyone would accept everwhere. Organized soccer began in 1863, when the English Football Association was founded in London. By the end of the year, the game split into two games, rugby and association football. That's when contemporary soccer history began. Rugby, which allowed players to touch and carry the ball with their hands, gave rise to American football. Association football (soccer) became popular in the rest of the world. Only eight years after its foundation, The Football Association already had 50 member clubs. The FA Cup (first soccer tournament in soccer history) was started in the same year. After the English Football Association, the next oldest are the Scottish FA (1873), the FA of Wales (1875) and the Irish FA (1880). 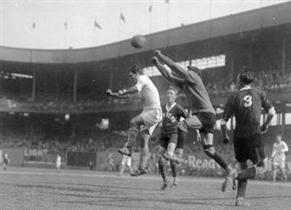 Soccer spread outside of Great Britain rapidly to all parts of the world. The next countries to form football associations were: Netherlands and Denmark (1889), New Zealand (1891), Argentina (1893), Chile (1895), Switzerland, Belgium (1895), Italy (1898), Germany, Uruguay (both in 1900), Hungary (1901) and Finland (1907). As soccer developed throughout the world, teams were playing against each other, and the need for proper organization grew. In 1904 delegates from France, Belgium, Denmark, the Netherlands, Spain, Sweden and Switzerland established FIFA - the international governing body of soccer - to "promote the game of association football". In 1912, 21 national associations were already affiliated to the Federation Internationale de Football Association (FIFA). By 1925, the number had increased to 36, in 1930 - the year of the first World Cup - it was 41, in 1938, 51 and in 1950, after the interval caused by the Second World War, the number had reached 73. At present, FIFA has over 200 members in every part of the world. By the way. Do you know where the term "soccer" came from? "Association football" was a long name, so some English college students began calling the game "assoc". The name was further shortened to "soc", and eventually became "soccer". Hopefully my presentation of soccer history was brief enough not to bore you, but with plenty of facts to satisfy your needs. If not, here is very extensive publication about soccer history.